Katie Glaubitz takes off on an RBI single in the sixth as her sister Rachel scores on the hit. 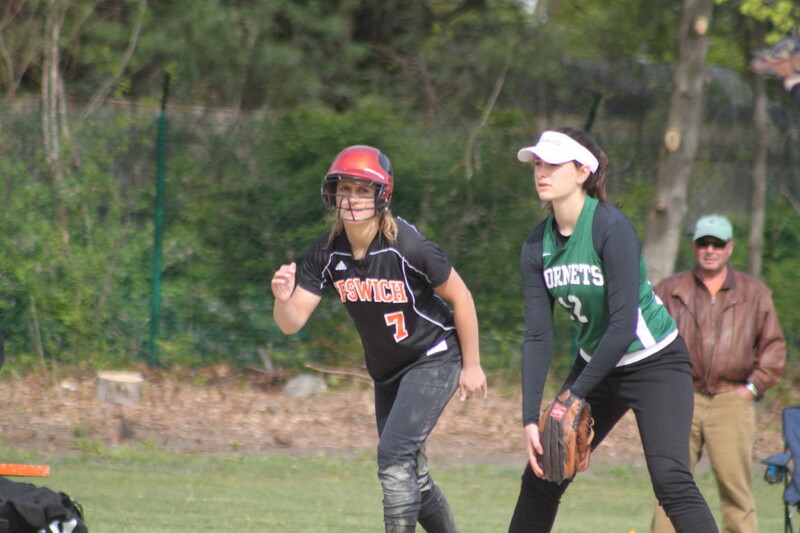 (Ipswich) The Ipswich Tigers got their elusive first win defeating Manchester-Essex, 5-2, at Bialek Park on a cloudy/windy/cold Monday afternoon in Cape Ann League softball. The Tigers, now 1-7, were led by the Glaubitz twins (Katie and Rachel). 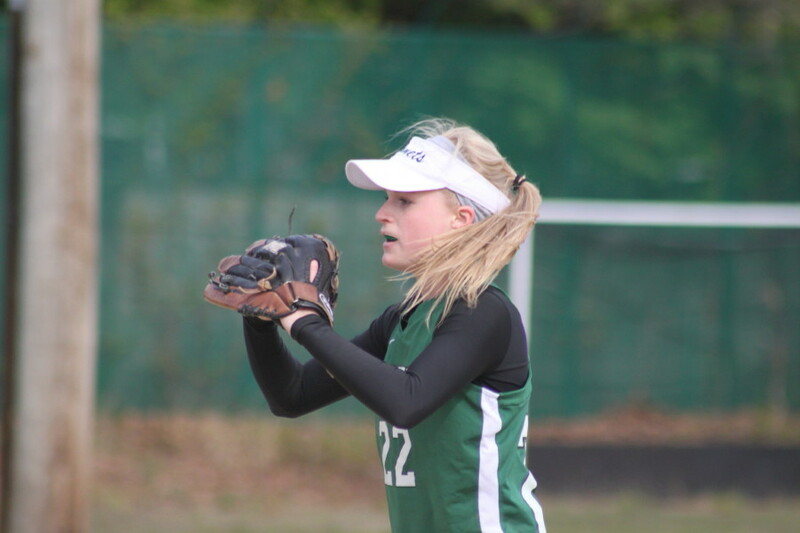 Katie pitched a complete-game six hitter, had two hits and three RBI. Rachel had two hits, scored two runs and drove one in. Ipswich scored three in the first and added two in the sixth. They had runners on in every inning thanks in part to ME starter Paige Zeval’s eight walks. 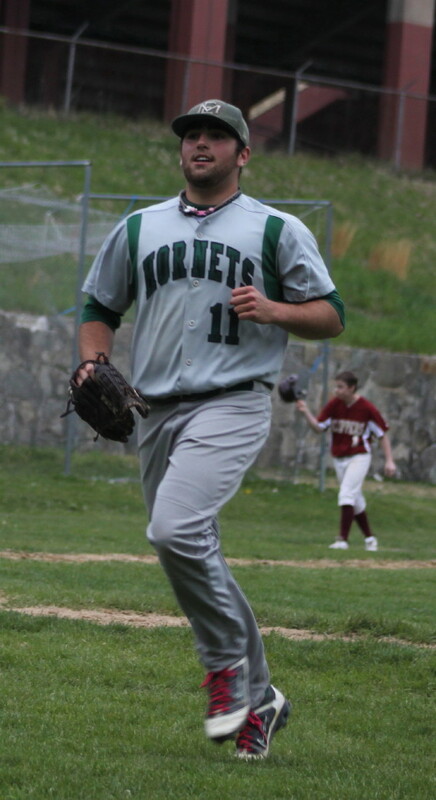 The Hornets (3-6) defeated Ipswich, 14-10, on April 6th in the season opener for both teams at Manchester. ME tallied solo runs in the second and seventh. Base-running miscues killed Hornet scoring chances in the fifth and sixth. The first four Tigers reached in the first inning and two runs were quickly in. Leadoff batter Carolyn Lynch walked (she did it four times) and reached third on Rachel Glaubitz’ single to right. Rachel took second without a throw. 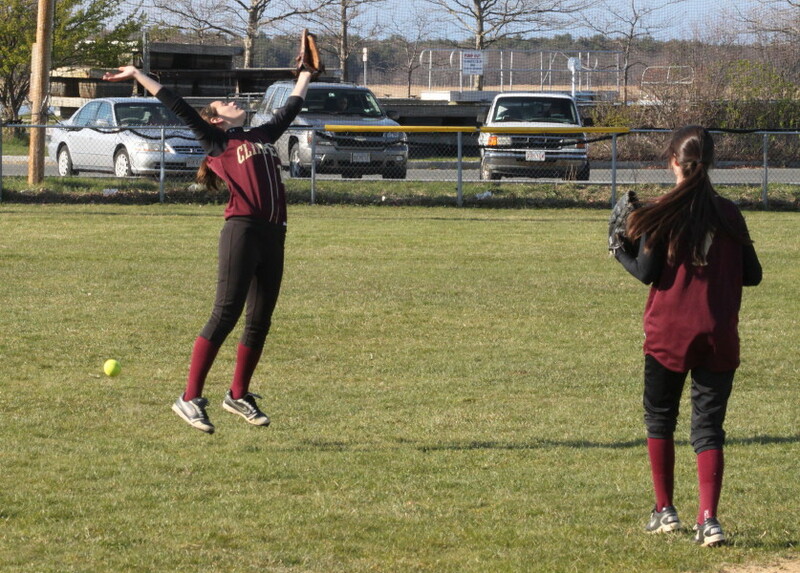 Sister Katie’s fly ball to left caught Mel Tognazzi too deep. Mel charged in (there was some serious wind) for a catch attempt but the ball caromed off her leg out of bounds scoring both runners. Later, Becca Dunlop’s fielder’s choice delivered Katie from third. The Hornets got a run back in the second. Rachel Gallagher singled up the middle with no outs. A Mel Tognazzi sacrifice bunt followed by Sarah Beckman’s fielder’s choice enabled Rachel to reach third. Sophomore Paige Zeval singled her home from there. It was a tense/tight 3-1 game until the bottom of the sixth when Ipswich picked up two very-much-needed, insurance runs. Sophomore Carolyn Lynch’s 4th walk started the rally with two outs. Rachel Glaubitz followed with a blast over Hornet centerfielder Coco Bradley’s head. Carolyn scored the Tigers’ 4th run on the play and Rachel reached third on the RBI triple. Her sister singled her home from there with the Tigers’ 5th run. Catcher Molly Mello and third baseman Megan Parella chase a popup. ME put two runners on with one out in their final at-bat. 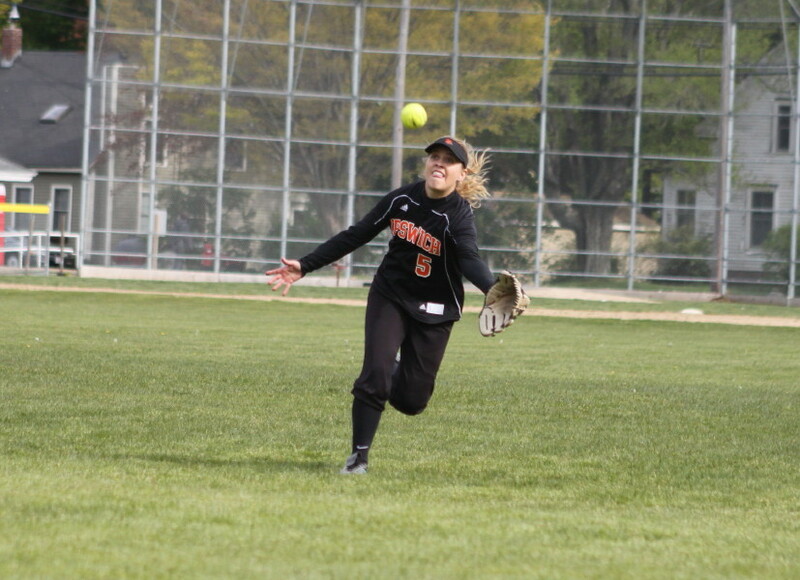 Third baseman Sami Wideburg then fielded a grounder and touched third. 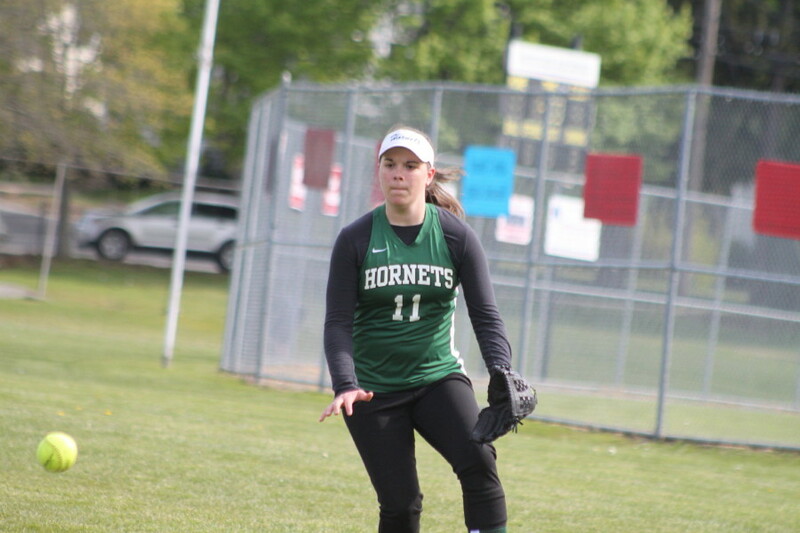 However, her attempt to get the batter (Sam Taylor) at first for a double play resulted in a bad throw and allowed Paige Zeval to cross with the Hornets’ 2nd run. Bailey Graves ended the game with a ground-out to second baseman Becca Dunlop. 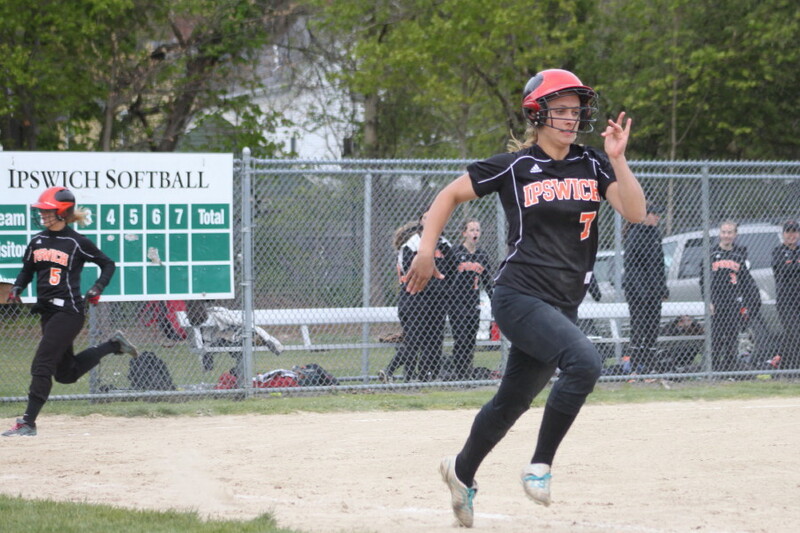 In the fifth inning, Bailey Graves was doubled off first after Ipswich shortstop Carolyn Lynch turned Nina Manzo’s line drive into an inning-ending double play. 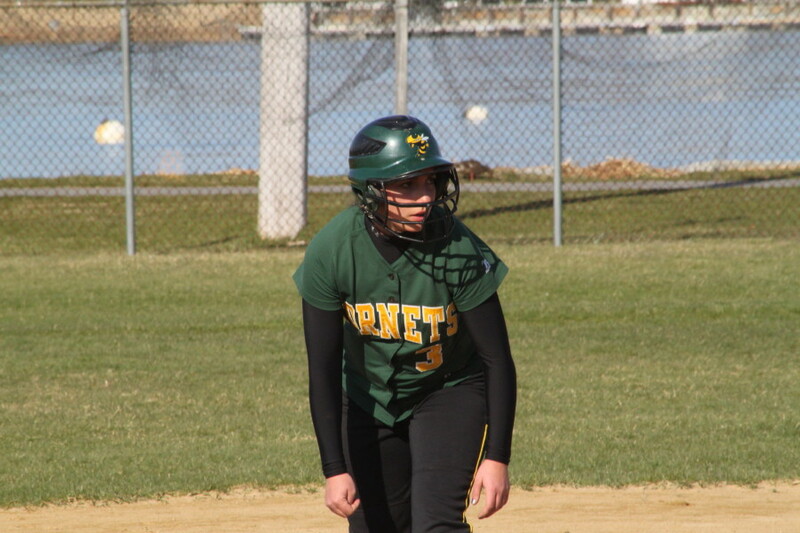 In the sixth inning, Hornets’ Rachel Gallagher doubled with two outs but was thrown out trying to steal third by Tiger catcher Molly Mello. The Tigers ran into a double play in the third. Pitcher Paige Zeval snared Becca Dunlop’s hot liner and doubled Katie Glaubitz off of 3rd to end that inning. Former Ipswich slugger Liz Glavin (Wentworth freshman) was on hand to cheer on the Tigers. Paige Zeval allowed only six hits. 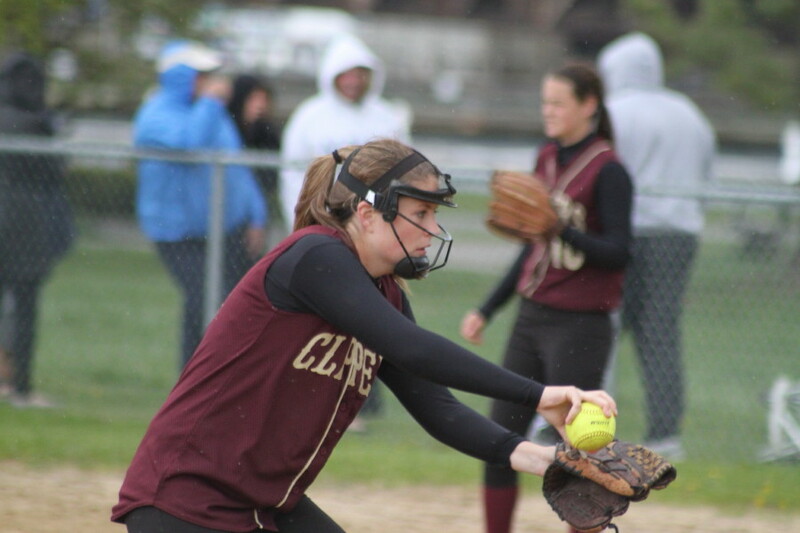 Katie Glaubitz struck out five and walked only one batter. 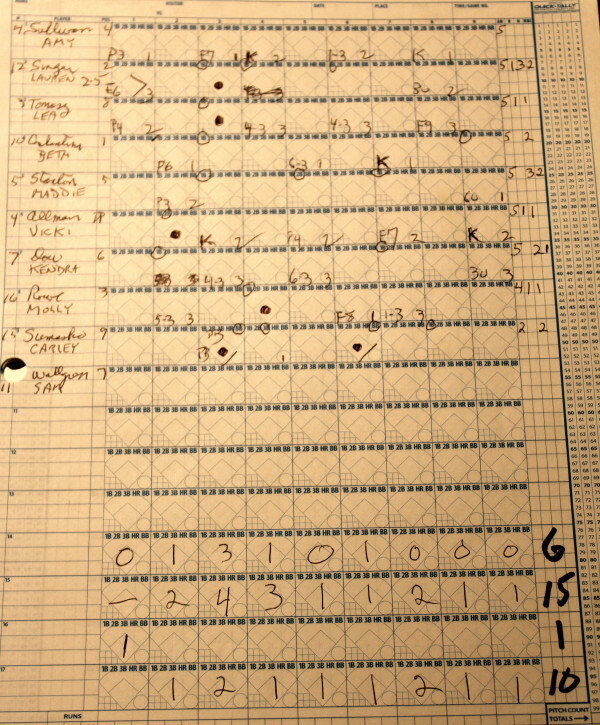 Nat Caponigro had a pinch hit single in the seventh for ME. 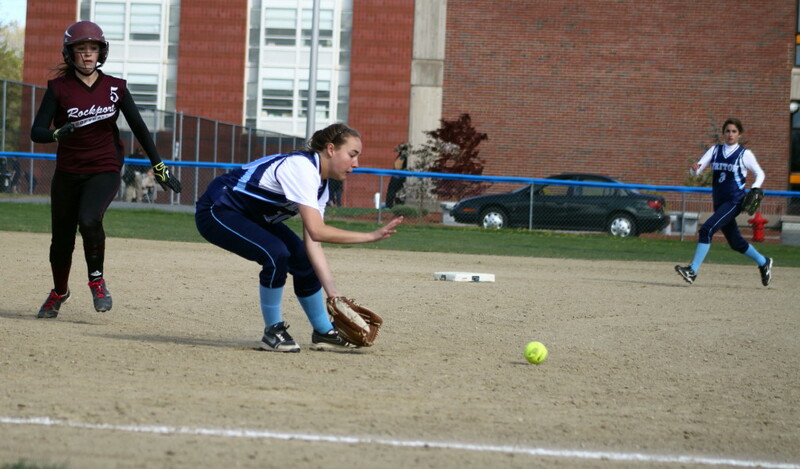 Shortstop Rachel Gallagher catches an infield popup. Rachel Gallagher led ME with two hits. The National Anthem was played before the game started. Next game for the Hornets is Wednesday at home versus Lynnfield. Ipswich travels for a makeup game in Tyngsboro against Notre Dame in non-league action tomorrow. Rachel Glaubitz charges a sinking liner. 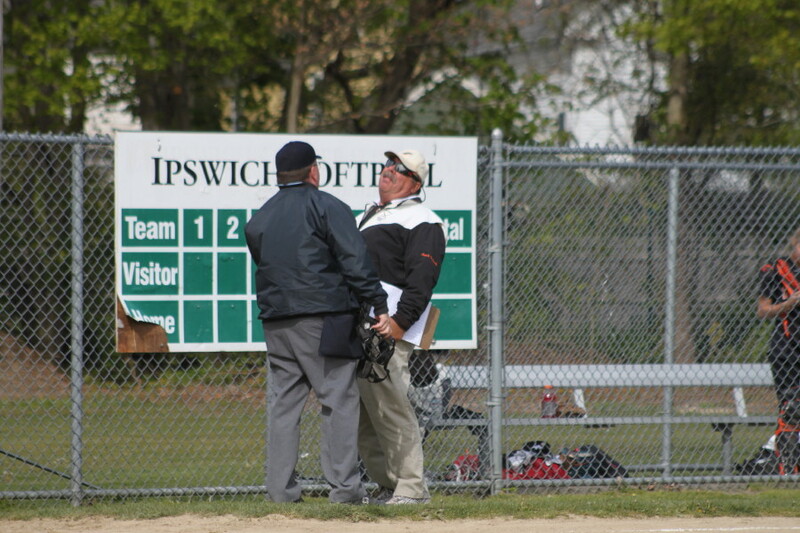 (Byfield) Memo to the rest of the Cape Ann League softball teams: Rockport is good….very good. Undefeated Rockport (8-0) shut out Triton, 9-0, on a windy Friday afternoon in Cape Ann League action at Triton. Senior Kristen Turner allowed Triton (2-6) only four singles and walked no one earning the win. Triton’s lone threat was in the sixth. They loaded the bases on two singles (Mara Spears & Cori Simons) and an error (Kendra Adams) with no outs. However, a force at home, a popup, and an infield grounder ended the one and only potentially big inning for Triton. Triton’s starter (Cori Simons) didn’t fare as well when Rockport loaded the bases against her in the first inning with no outs. Passed balls brought in two runs (Hannah Lorden & Mollie Watson) and a fielder’s choice RBI by Kendra Adams scored Gabby Muniz with Rockport’s third tally. 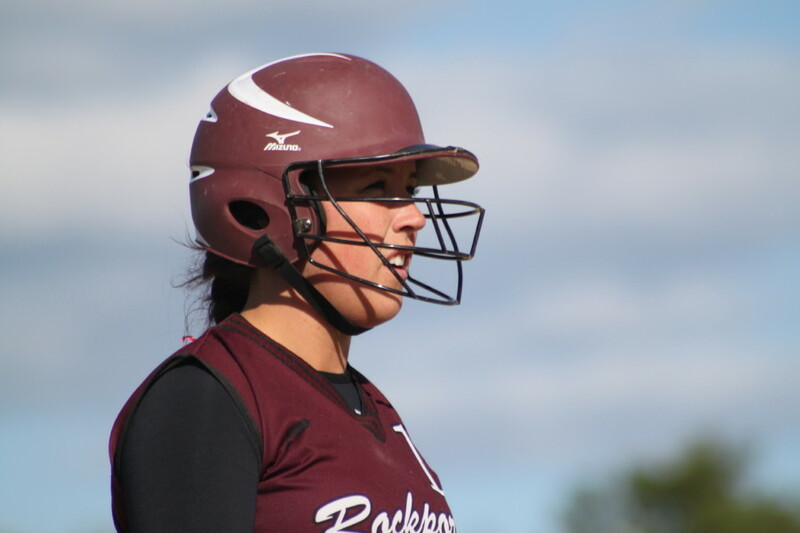 That was more than enough runs for Rockport as Kristen locked down Triton with only two singles through the first five innings. 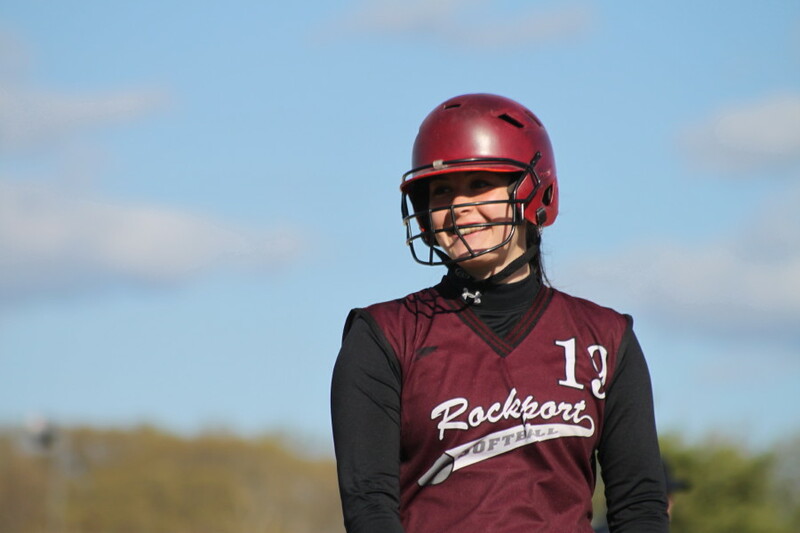 Rockport had runners on in every inning and it was a credit to pitcher Cori Simons and her teammates that they recovered from the first inning (three runs) and held Rockport scoreless over the next three innings. Rockport collected their fourth run in the fifth inning. 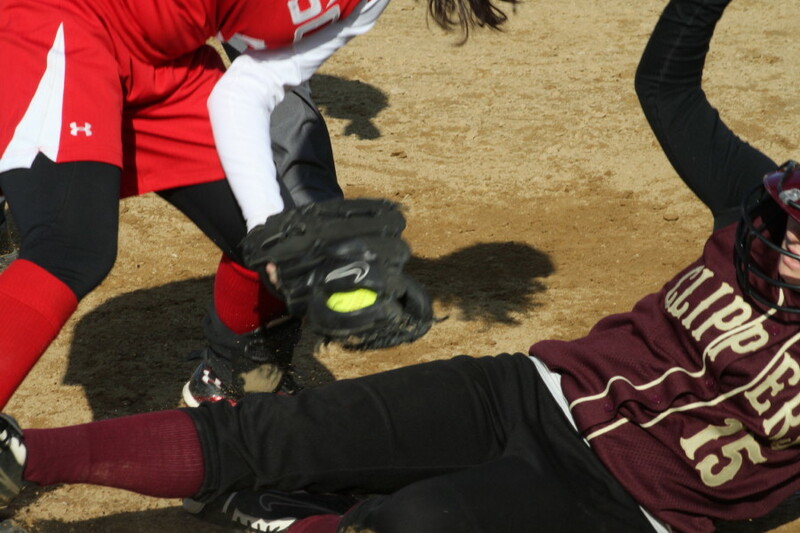 Kendra Adams reached on an error (Kylie Gilroy), went to third on a Kayla Parisi single, and scored on a passed ball. A walk (Hannah Lorden), an RBI double (Mollie Watson), and an RBI triple (Gabby Muniz) and Rockport had two more runs in the sixth. A passed ball allowed Gabby to score Rockport’s seventh run. Two more runs were added in the seventh. After two outs, Hannah Lorden walked, went to second on a passed ball, and scored on Lily Anderson’s (first baseman) drop. Gabby Muniz (single) drove in Mollie Watson with the final run. The top three in the Rockport batting order were extremely productive. Leadoff hitter Hannah Lorden was 2-for-2 plus three walks and three runs scored. Mollie Watson was 2-for-5 including a double, scored three runs, and had an RBI. Gabby Muniz was 2-for-4 including a triple, scored two runs, and had two RBI. These three girls are all sophomores! Last year Gabby was Player-of-the-Year in CAL D3 while Mollie was a CAL All-Star. 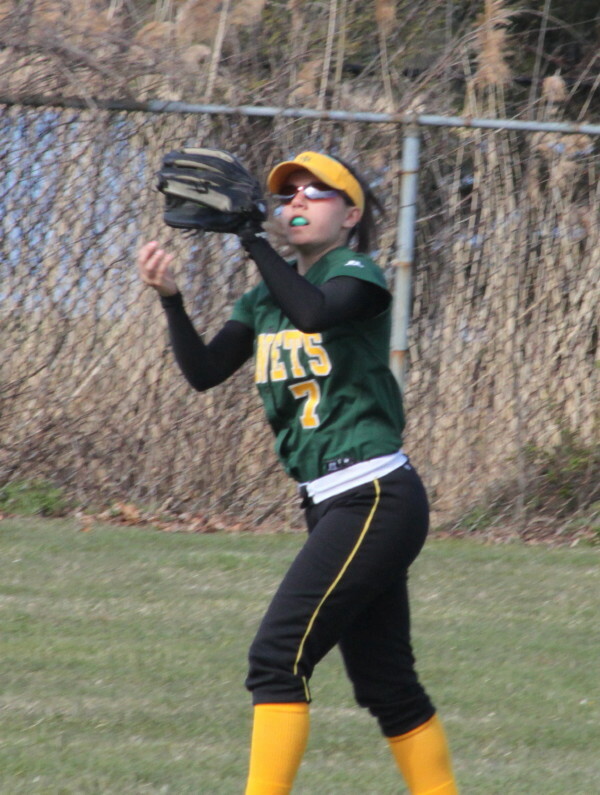 Kayla Parisi had two hits for Rockport and Cori Simons had two for Triton. Rockport went 9-11 last season and lost in the first round of the state tournament. I can’t guess how they’ll do in the 2012 state tournament but I am quite certain, from what I saw today, that they will be a high seed in the tourney. 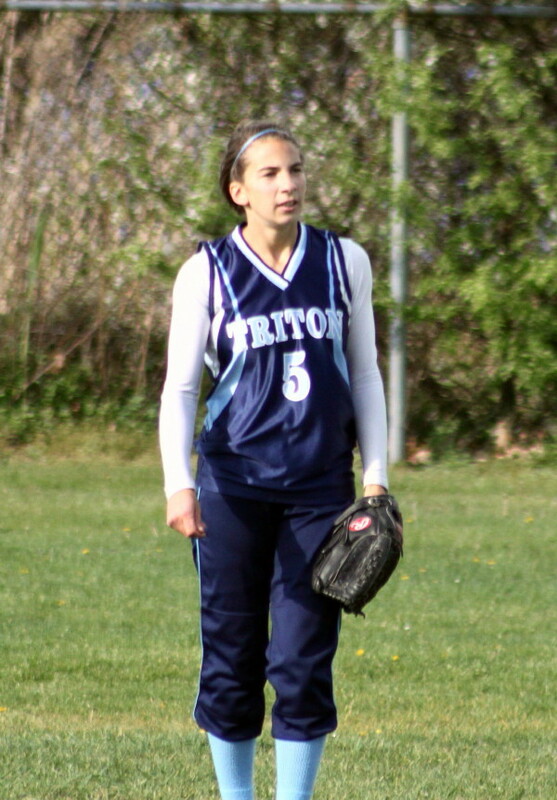 Triton pitching (Cori Simons & Mara Spears) gave up six walks and nine hits. The mix of base runners and passed balls was not a good one for Triton. Rockport’s next game is home against Masco on Monday afternoon. Masco lost its first game today versus Lynnfield. Third baseman Casey Ross fields a grounder. Triton travels to Georgetown on Monday. It is easy to pick the Triton fans from others. On a sunny afternoon with temperatures in the 50s elsewhere, they show up wearing what could pass as winter gear – warm hats, gloves, etc.. And as they know from experience, by the time the game ended that gear made perfect sense. 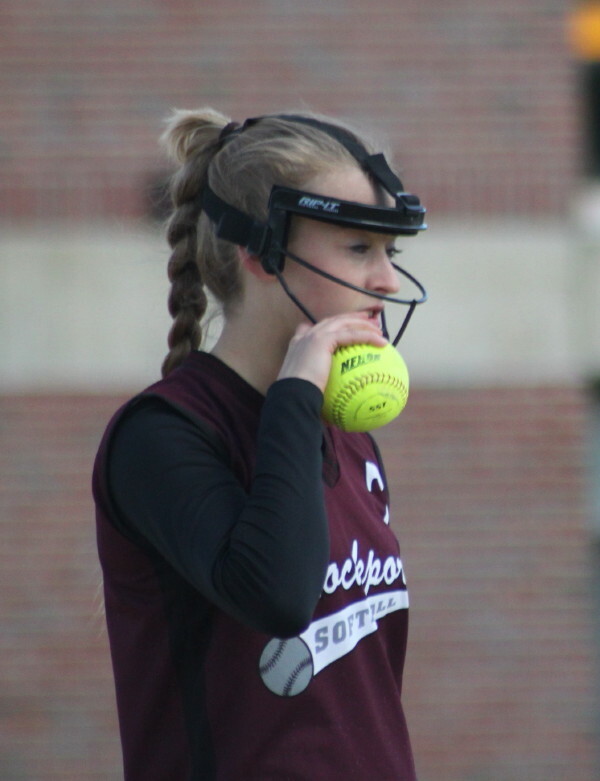 Kristen Turner has pitched four years for Rockport. 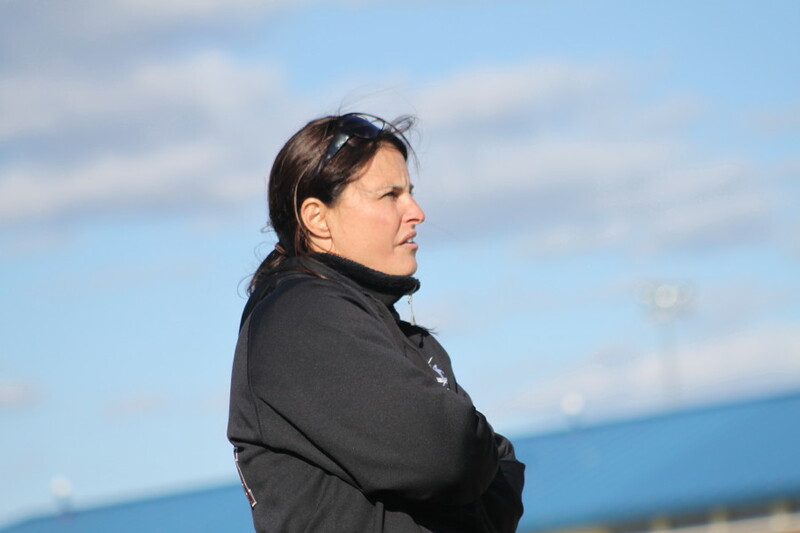 Coach Diane Parisi told me that her freshman daughter (Kayla) can pitch. 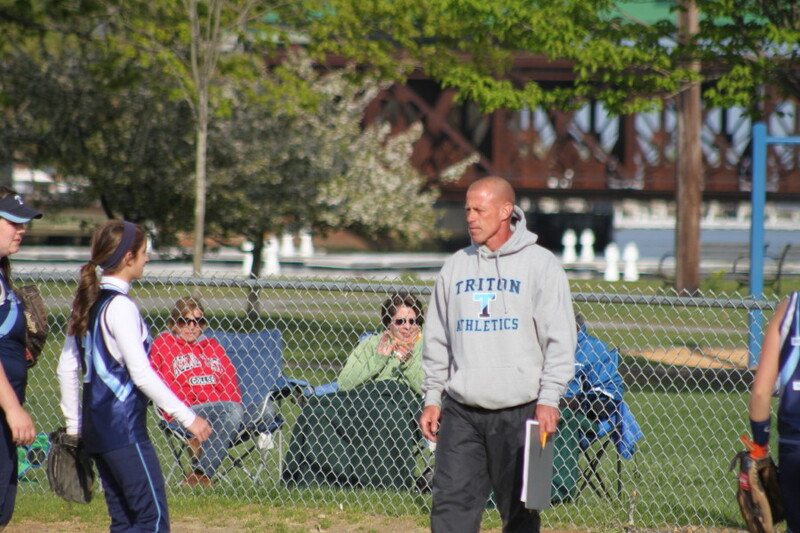 Triton coach Jim Hounam sent up three pinch hitters in the bottom of the seventh and Kristen struck out all of them. 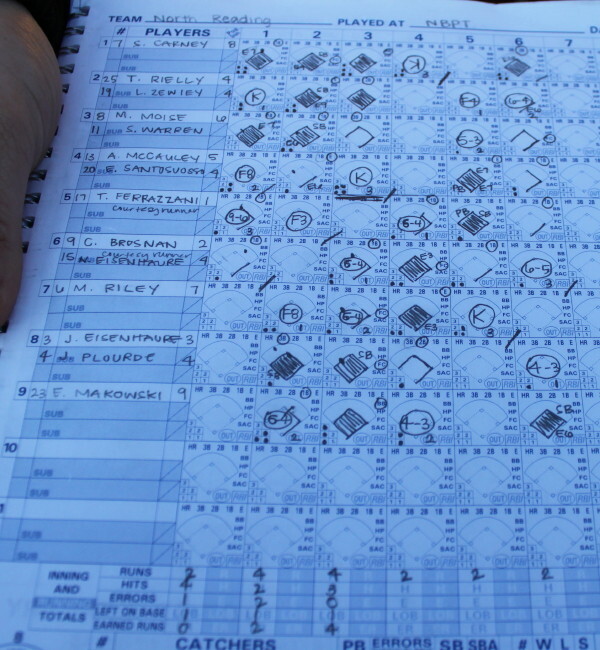 She had six K’s for the game. According to the Gloucester Times, Rockport’s 7-0 start was the best ever for the softball program. That was topped today with an 8-0 start. Joe Burgess rounds first. 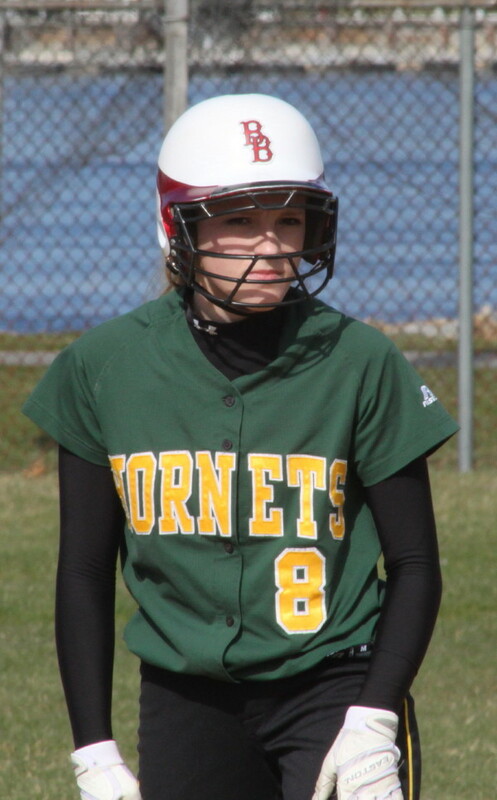 The Hornet senior had three hits and scored two runs in the ME upset. 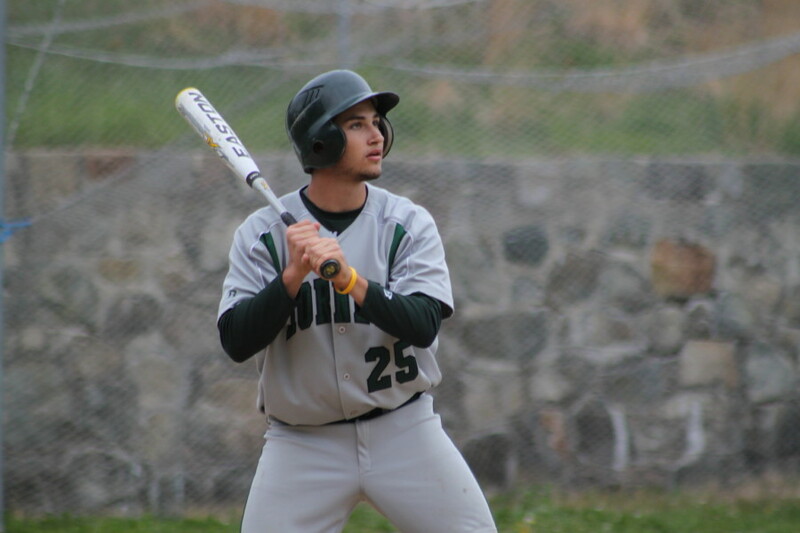 Complete game winner Adrian Frattini scattered seven hits and assisted on the last out of the game. (Newburyport) Who saw this coming? Undefeated Newburyport was riding an 18-game winning streak going back into last season. They’re the defending Division 3 state champs. Manchester-Essex was 2-16 last year and 2-3 this season with losses to Georgetown, Rockport, and Amesbury. 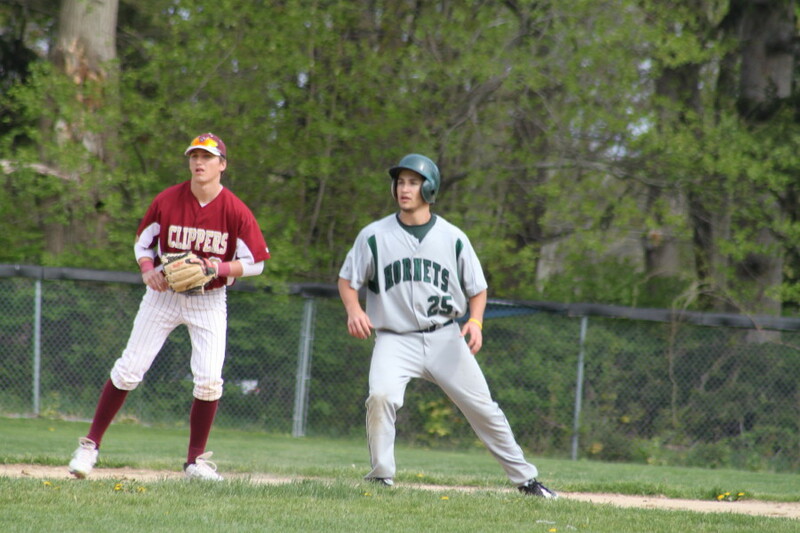 But at the end of this Thursday afternoon game the Hornets (3-3) were jumping up and down after a 5-2 upset over the Clippers (5-1) at cold and cloudy Pettingell Field in a Cape Ann League contest. Winning pitcher Adrian Frattini had run support early (up 4-0 after 2 ½ innings) and scattered seven hits over seven innings. 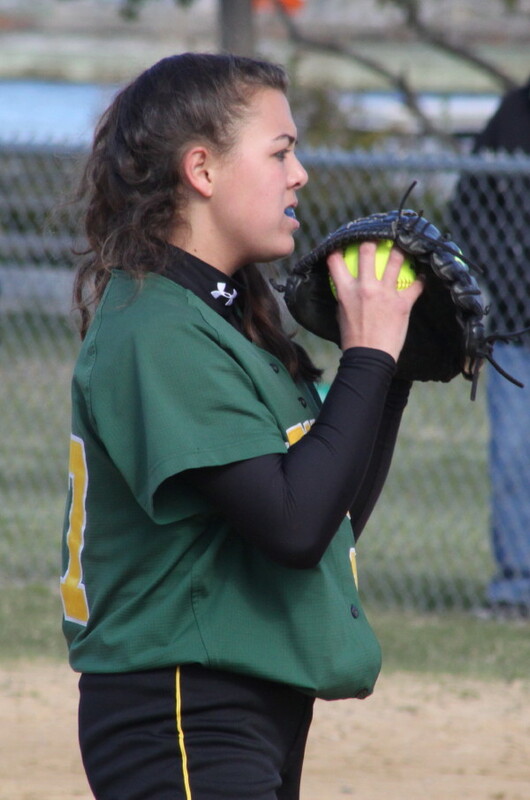 For 6 ½ innings the Hornets played like they were the defending state champs showing strong pitching, timely hitting and flawless fielding, but in the bottom of the seventh, with a 5-2 lead, they started to unravel. Clipper pinch hitter Ryan Short reached first after a passed ball on a strikeout with one out. After a back-to-the-fence flyout by Colby Morris, shortstop Joe Burgess fell down trying to field Ian Michaels grounder putting two runners on with two outs. Up stepped CAL All-Leaguer Brett Fontaine. He hit a grounder to the right of first baseman Max Nesbit that had “routine out” written all over it. However, pitcher Adrian Frattini was late coming over to cover and the hustling Brett Fontaine beat the throw. 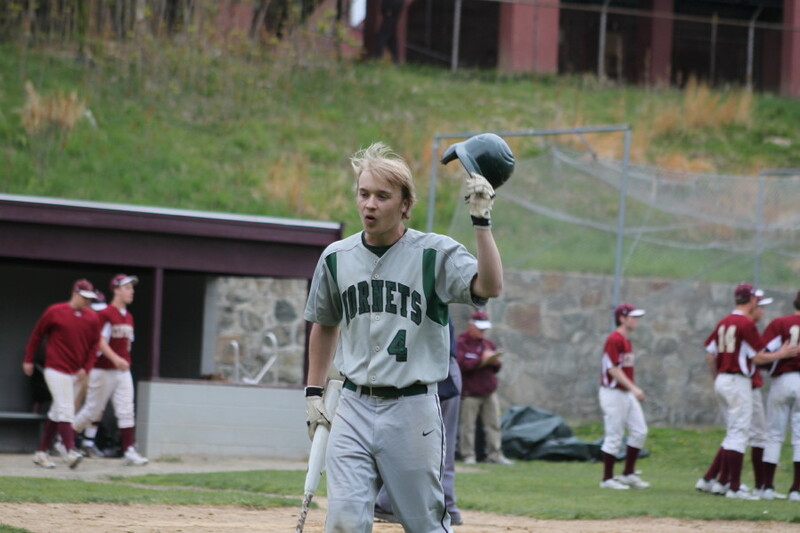 But then ME got the game-ending break as Ryan Short tried to score from second on Brett’s grounder and Adrian’s throw to Dom Cirone nailed him by plenty to secure the Hornet upset. 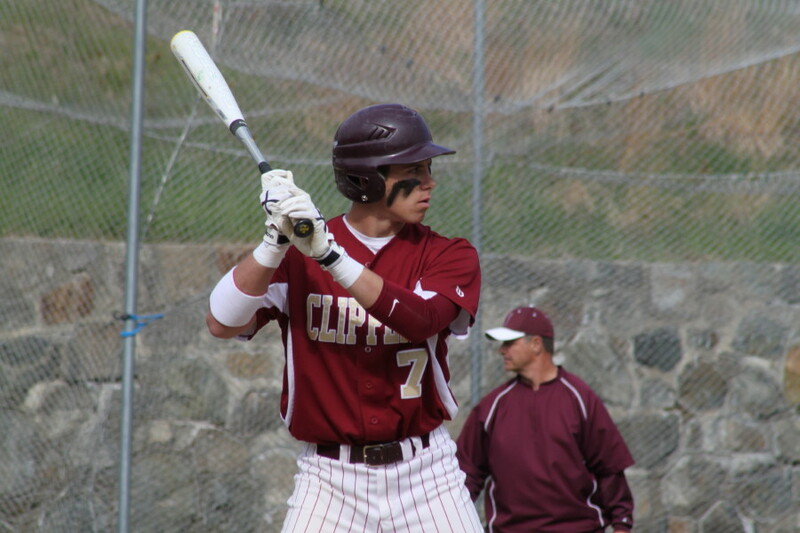 Newburyport had another basepath blunder in the 4th inning when Connor MacRae strayed too far off second base on a sacrifice fly and was picked off. First-time Clipper starter Evan Habib gave up a double to Joe Burgess on the first pitch he threw and was down 2-0 after three batters. John Browning delivered the first run with a double over leftfielder Mike Sweeney’s head. John scored on Matt Corwin’s single to right. Evan faced the top of the order again in the third inning and surrendered two more runs. Another double by Joe Burgess (he was 3-for-3), started things and a single to right center by John Browning moved Joe to third. Joe registered the Hornets’ third run of the game on a wild pitch. John would come home with Run #4 on a Max Nesbit sacrifice fly. Stephen Singer came on to pitch to the Hornets in the 4th. His problem was wildness. Three walks, one of them intentional to Joe Burgess, and a hit batsman (John Browning) gave ME a 5-0 advantage after 3 ½ innings. It looked as if the Clipper fortunes were changing for the better in the bottom of the 4th after Colton Fontaine got an extra swing because John Browning misjudged his foul fly. Sure enough, Colton ripped the next pitch to left for a single. Jimmy Conway followed with a walk before Connor MacRae laced a high fastball to left center for a double driving in Colton and sending Jimmy to third. So there it was nicely set up for Newburyport; a run in, two runners in scoring position, and no one out. But instead of a really big 4th inning the Clippers sacrifice flied into a double play and Ben Greene grounded out to short. The Clippers got two runs but the chance for more escaped them. Stephen Singer pitched his way out of a base loaded, nobody out, big-time jam in the fifth with a force at home surrounded by two strikeouts. That escape kept the deficit at three runs (5-2) but the Clippers couldn’t rally back over the last two innings and get their first loss of the season. This was Adrian Frattini’s first start of the season. It certainly shouldn’t be his last! Noah Brown and freshman John Browning each had two hits for ME. 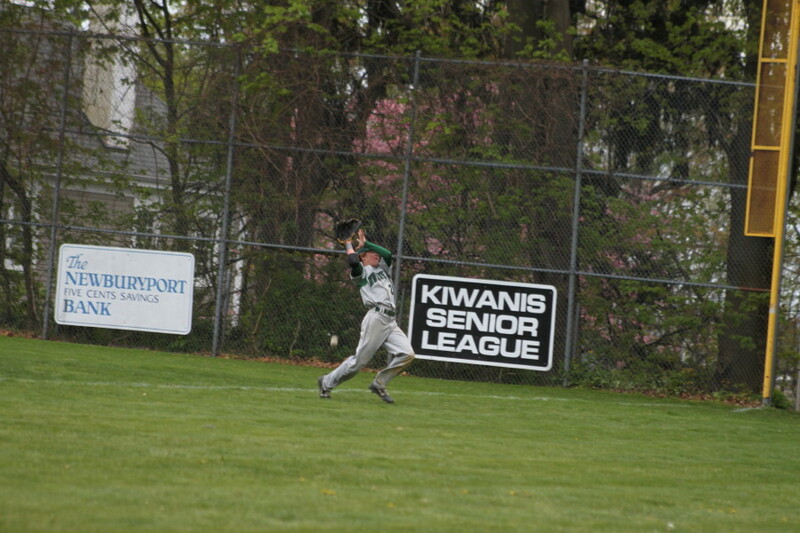 Centerfielder Ian Michaels had two hits for the Clippers. Manchester-Essex faces Ipswich at home on Saturday afternoon (1PM). Newburyport rematches with North Reading on the same day at home at 10AM. 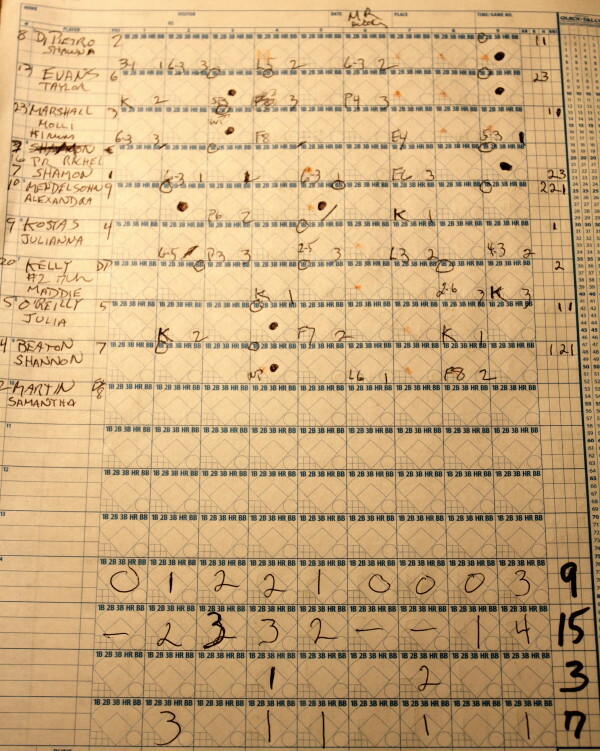 The Clippers won the first meeting, 1-0, on April 13th. As the Hornets carried the lead into the late innings someone on the ME bench said, “This is like the US against Russia,” recalling the Lake Placid upset by the American Olympians. Amy Sullivan tries for third as Kelsey Trudel prepares to throw her out. Cori Simons struck out four and had two hits. 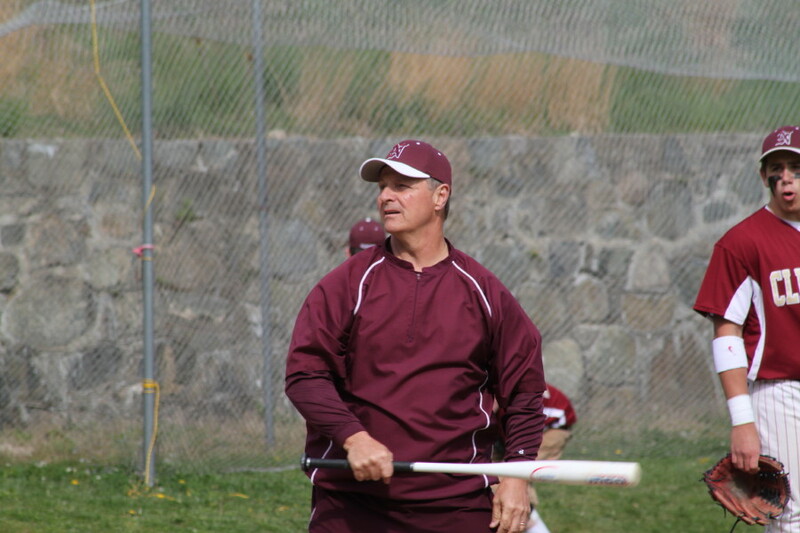 (Newburyport) Triton combined flawless fielding with a Cori Simons six-hitter and started the Cape Ann League regular season with a 6-3 win over Newburyport on Wednesday afternoon at Cashman Park. The senior-less Vikings (2-5) tallied three runs in the first and never trailed. The Clippers (3-4) got within a run in the fourth but a collection of loud outs with runners in scoring position, and base running gaffes, kept them from getting closer. Newburyport ended three innings with loud outs to the outfield with runners aboard. They also ran into a double play in the seventh on a rope to shortstop Shannon Sinton. 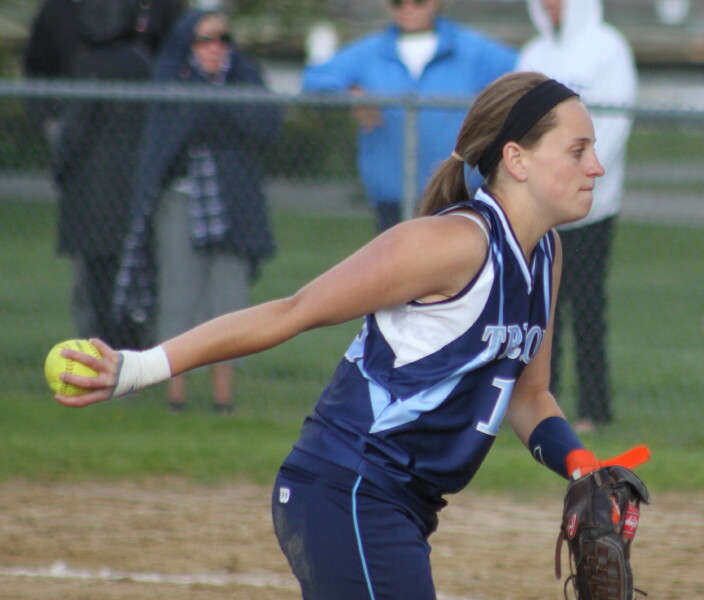 Triton had nine hits off of Molly Rowe including four in the first and another three in the fifth. Bunching those hits produced five Viking runs. 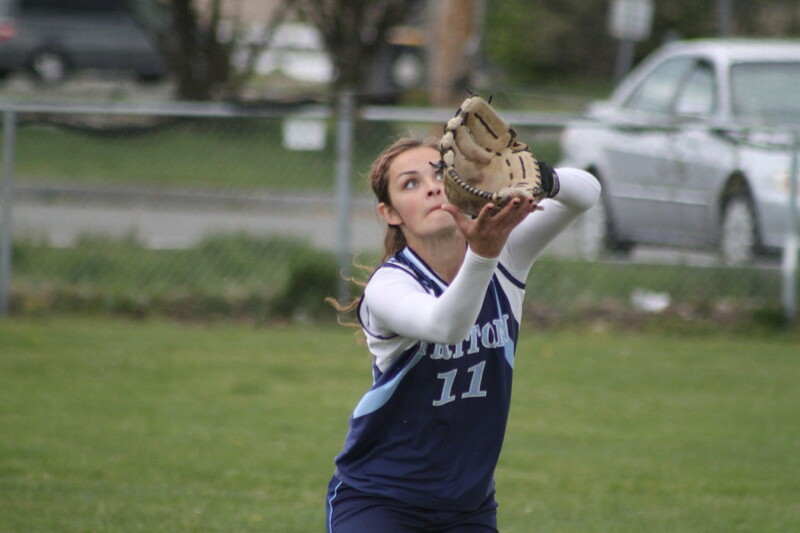 In the Triton first, Shannon Sinton and Jeanne Martin had singles off second baseman Amy Sullivan’s glove. An inch or two either way and they would have been outs but on this day Shannon eventually scored (passed ball) and Jeanne drove in Kelsey Trudel with the third Viking run. Lea Tomasz slides under the tag of Rose Gaffins. Newburyport got two back in their half of the fourth. Lea Tomasz delivered Carley Siemasko with a long double to left. Lea took third on the throw to the plate and came home on a passed ball. Triton came right back with two in the fifth. A perfectly executed sacrifice bunt by Shannon Sinton put Mara Spears in scoring position. Cori Simons’ single to right brought Mara in with Run #4. Cori then stole second, reached 3rd on a fielder’s choice and came in on a controversial (was it fair?) flair near the right field line. Several bad throws gave the Vikings a gift run in the 7th with pinch runner Ashley Shute scoring on Lily Anderson’s single to deep short. 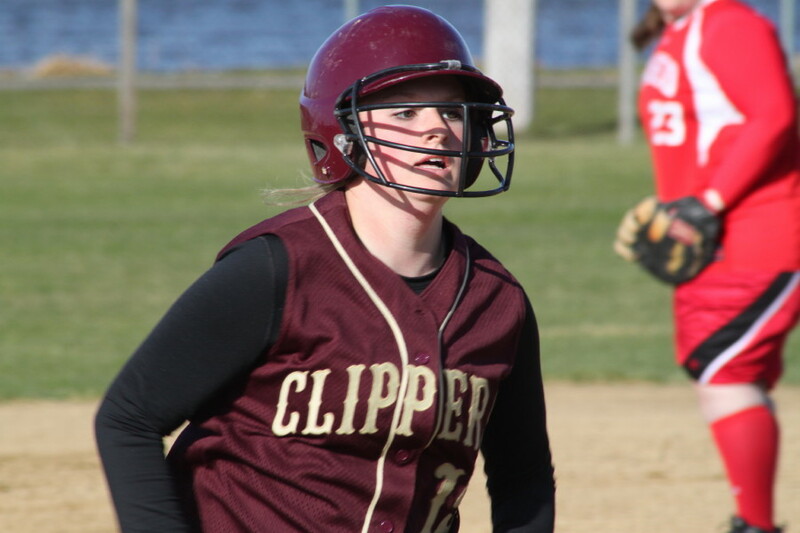 Down by four in their last at-bats, the Clippers had the makings of a big rally after a double (Molly Rowe) and a single (Beth Castantini) turned up a run with no outs. But Sam Wahlgren’s line drive was right at shortstop Shannon Sinton and she turned it into a double play. Cori Simons finished the game recording her fourth strikeout. Aggressive base running was good news/bad news for Amy Sullivan. The sophomore second baseman stole second in the six inning but got caught easily trying to take third on the overthrow. Newburyport has played six of its first seven games at home. They will play at Manchester-Essex on Friday. Triton will face Rockport at home on Friday. Had the weather trifecta at Cashman – cloudy, rainy, and sunny. Kendra Dow makes a running catch as teammate Sam Wahlgren looks for a deflection. Amy Sullivan and Kendra Dow had nice catches on popups. 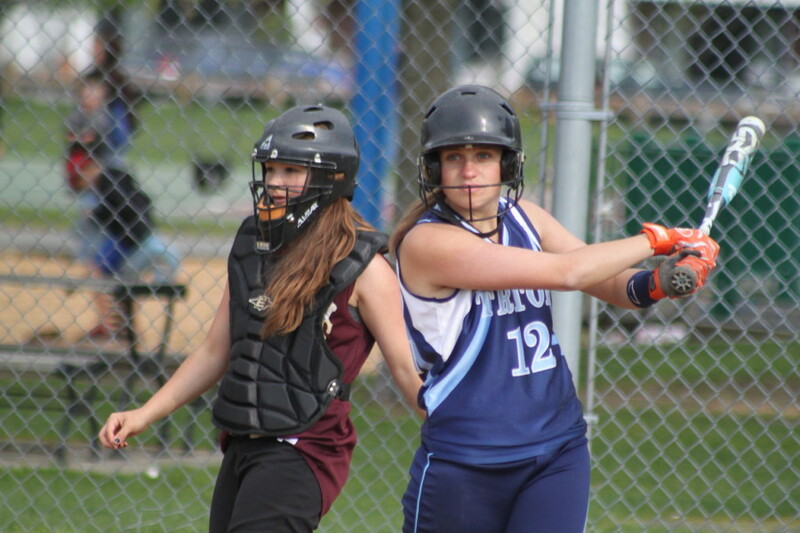 Cori Simons, Lily Anderson, and Kelsey Trudel each had two hits for Triton. 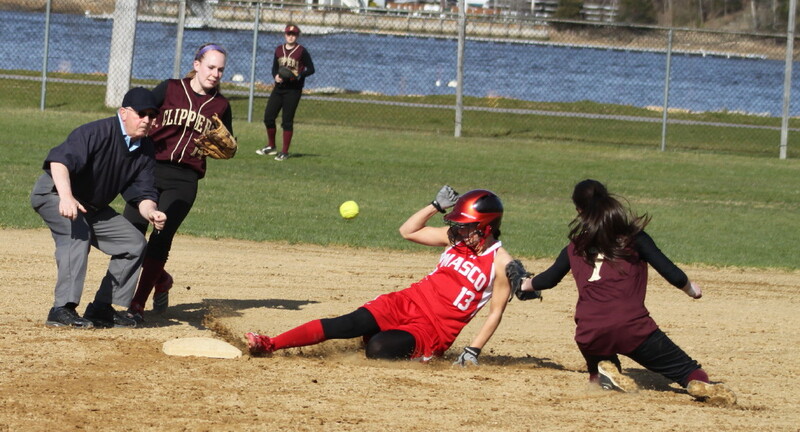 Beth Castantini had two for Newburyport. On the controversial (Is it fair?) fly to right in the Triton sixth inning, the home plate umpire had to make the call. The problem was that he was looking over/around several players to do it. Where was the other ump? Because there were runners on base, he wasn’t on the first base line. It interests me the way Scripture, written so long ago, can relate to nowadays. I was reflecting on the deadly weather in the Midwest and thinking of it in relation to how to pray about it. A Moses story came to mind. Moses was up on Mount Sinai for forty days with God, receiving the Ten Commandments. During the end of the visit God gave Moses a disastrous report about the people he had left behind. God reported that during the brief absence the Israelites had constructed an idol (golden calf) to worship. God cannot tolerate other gods. Moses fell on his face before God fasting for forty days as he interceded for the Israelites. The interceding worked and the Israelites were spared. Here is the great Scriptural summary by Moses of the incident. Moses interceded for the Israelites, in general, and for Aaron specifically. God answered both prayers. 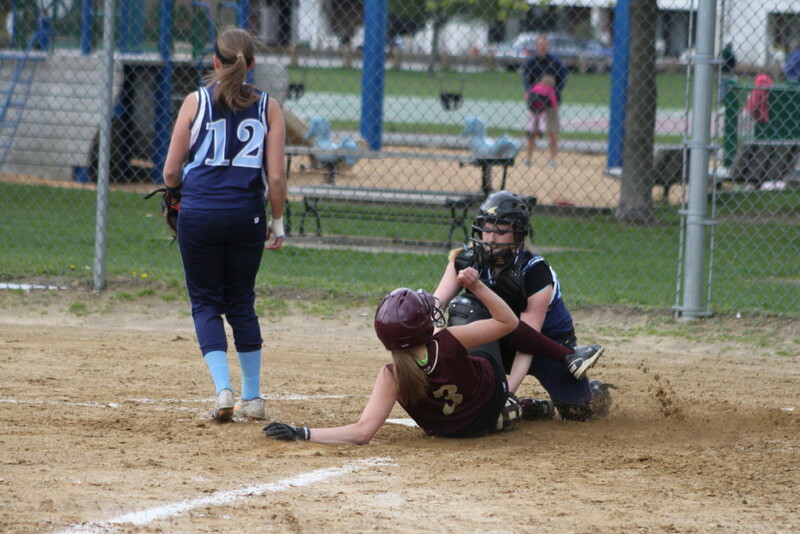 Lauren Singer tagged out at third by Julia OReilly. 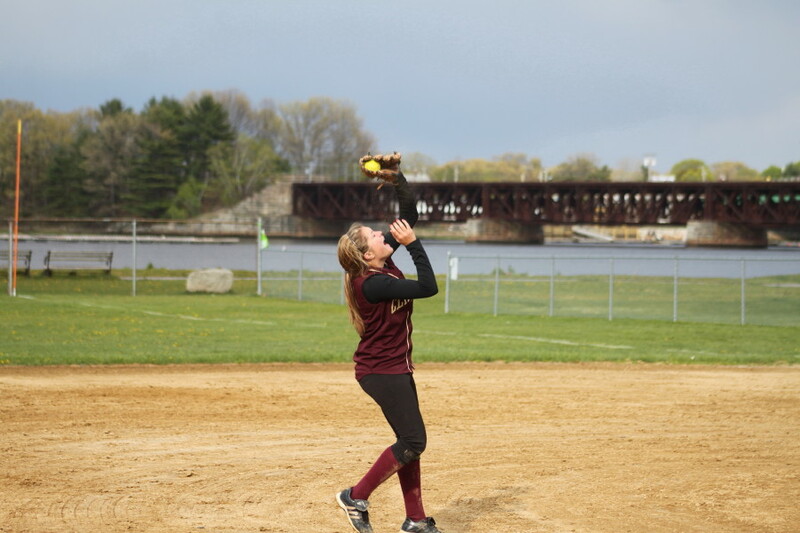 (Newburyport) A lot of, “Where have you been’s,” were probably heard after the Masco/Newburyport softball game at Cashman Park on Friday afternoon. Why? 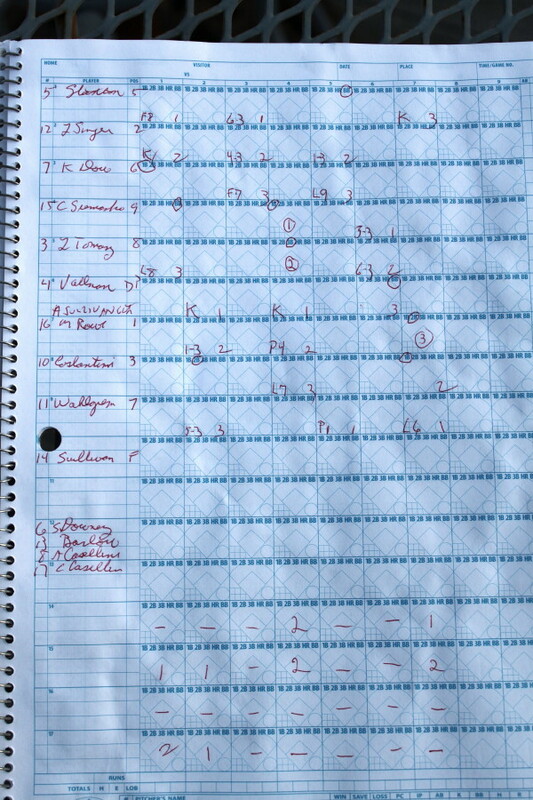 Those on hand saw nine innings and thirty hits (fifteen apiece) before Masconomet (4-0) defeated Newburyport, 9-6, and some of those attending may have gotten home a little late for supper. The Clippers (1-2) tied the score in the sixth on a Lauren Singer RBI single and had promising opportunities in the seventh and eighth to get a walk-off win. 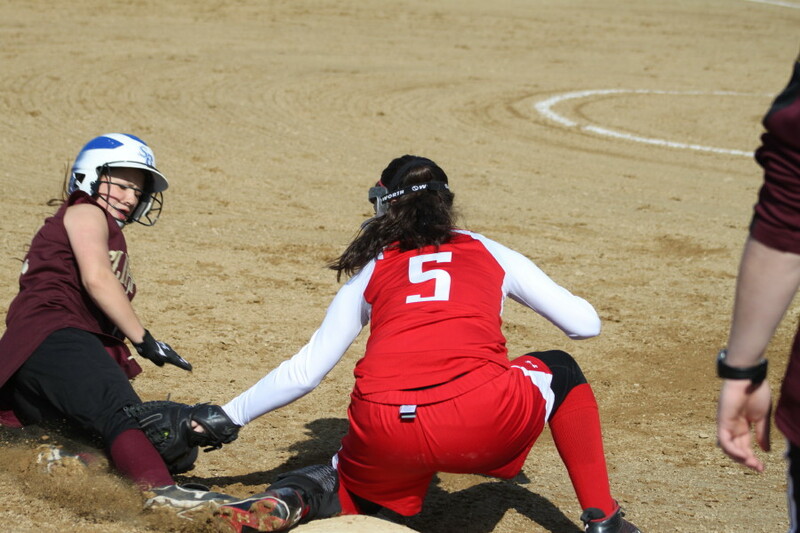 Masco pitcher Rachel Shamon, however, escaped a 2-on situation in the 7th by getting Molly Rowe to ground out. In the 8th, Carley Siemasko led off with a single and reached second on a wild pitch but Rachel got Lea Tomasz to fly to right to end that threat. 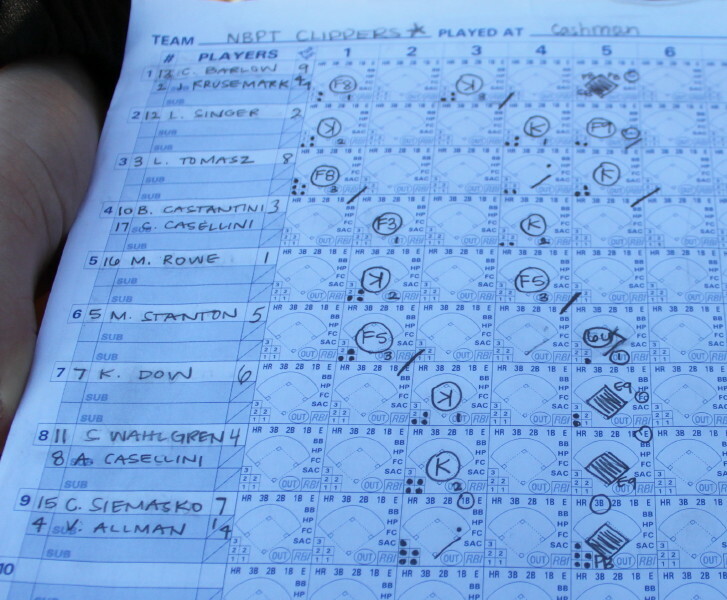 The Chieftains won this game with three runs in the ninth. Rachel Shamon drilled a shot to center that brought home two of the runs. Later, Alexandra Mendelsohn would deliver the third run with a single to right. That was more than enough runs for Rachel to work with in the bottom of the ninth. She gave up a hit to Beth Castantini to lead off the inning but retired the next three batters in order to end the game. 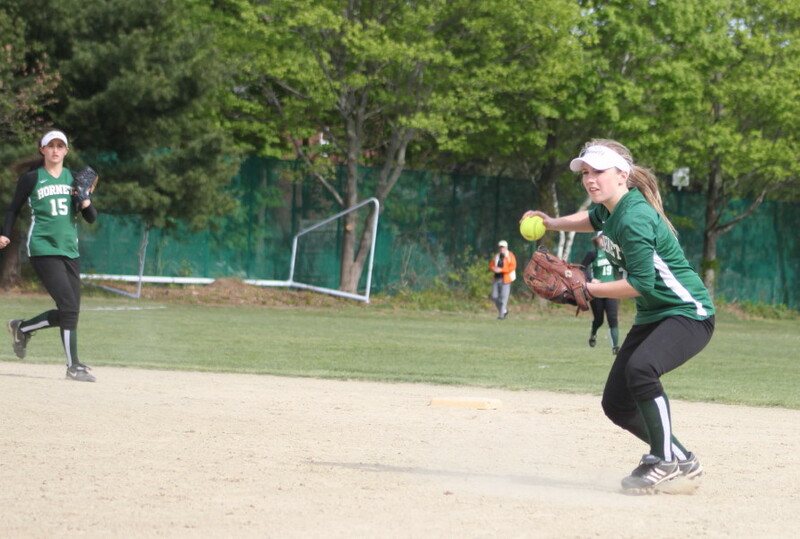 Rachel (junior) ended up with three RBI and five strikeouts. Masco took a 1-0 lead in the second when Shannon Beaton’s bloop single over the drawn in Clipper infield scored Alexandra Mendelsohn. 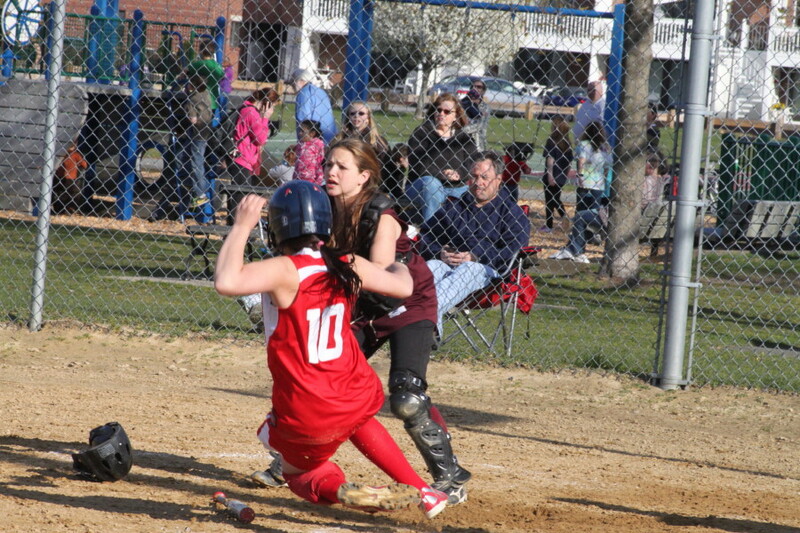 Vicki Allman came across in the second for Newburyport on Kendra Dow’s single to right to tie the score. 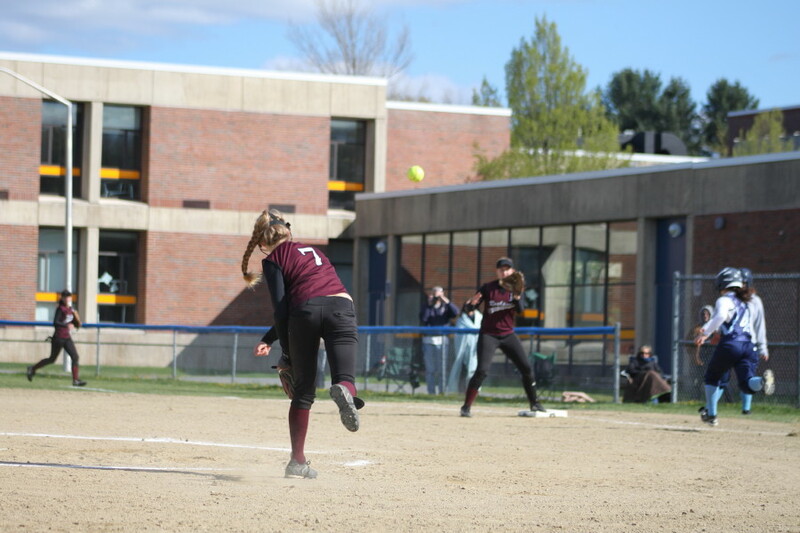 RBI’s by Molli Marshall and Rachel Shamon put Masco in front 3-1 after 2 ½ innings but the Clippers came right back with three runs of their own to get ahead, 4-3. Lauren Singer drove in the first of the three runs with a single past first and later Maddie Stanton’s single up the middle brought in two more. The Clippers handed out two gifts in the fourth. After Julia O’Reilly reached on an infield single, Shannon Beaton dropped down a bunt. The Clippers tried to get the runner going to second. 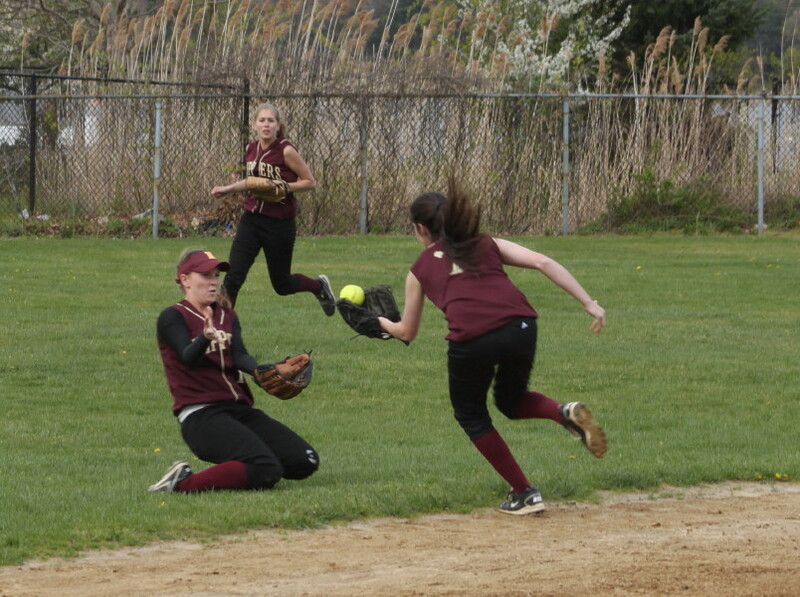 The throw was wild and by the time Newburyport recovered, Julia had scored and Shannon was on third. 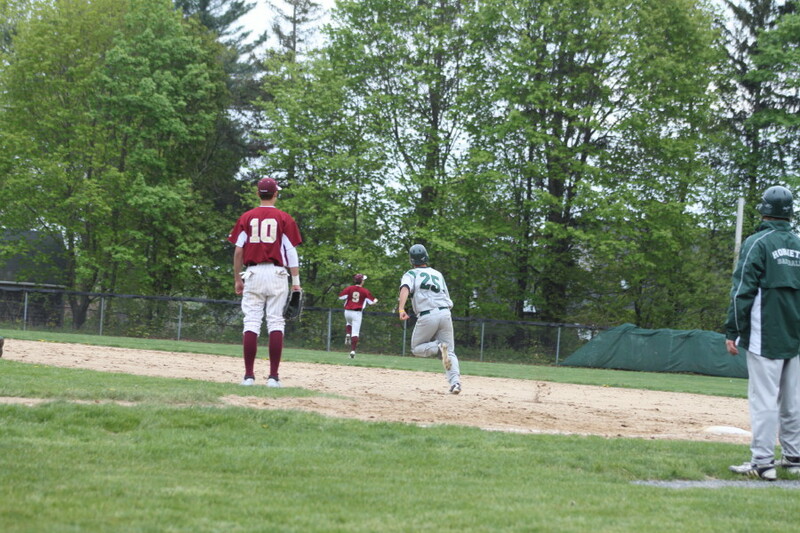 So instead of an out and a runner on, Masco had a run in and a runner on third. 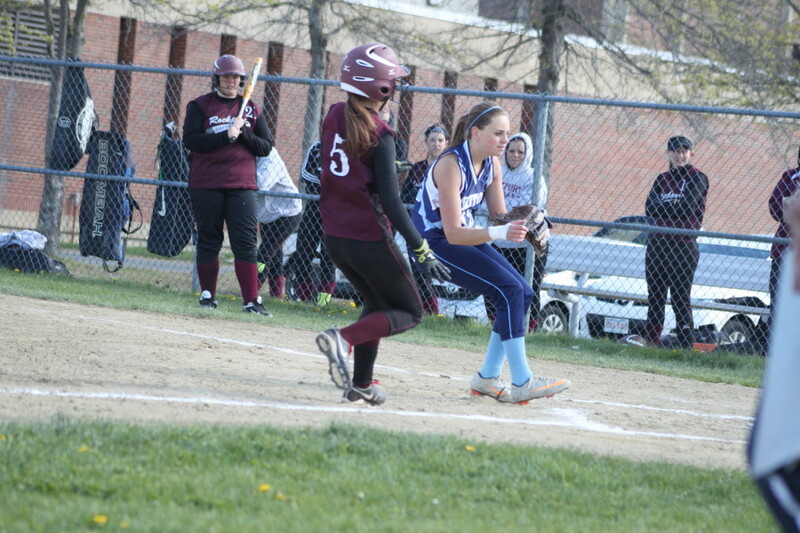 A wild pitch enabled Shannon to score Masco’s third run of the inning and sixth run of the game. Carley Siemasko nailed at third. In the bottom of the fourth, Newburyport ran into an out. Molly Rowe reached on an infield single. 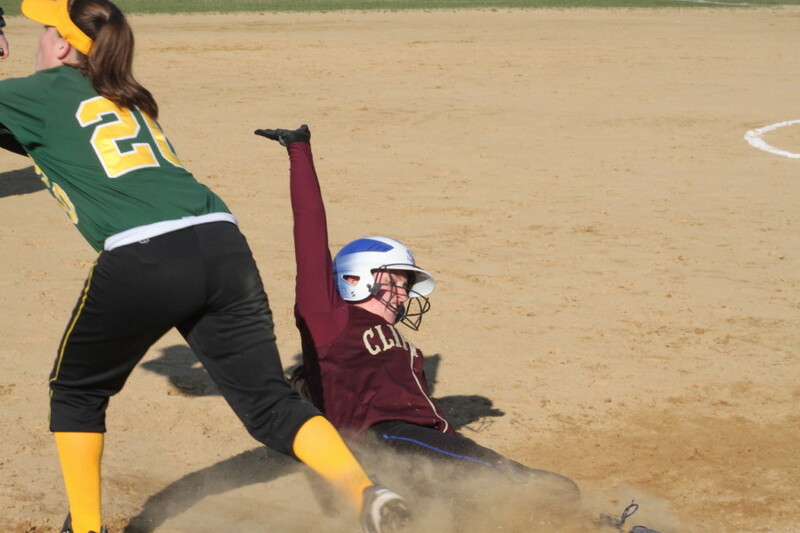 Carley Siemasko hit a long triple scoring Molly but was picked off after putting on the brakes too far beyond third. As luck would have it, two batters later Lauren Singer hit a single that would have scored Carley. The Clippers had to settle for only one run in that inning but they had tied the score at five. 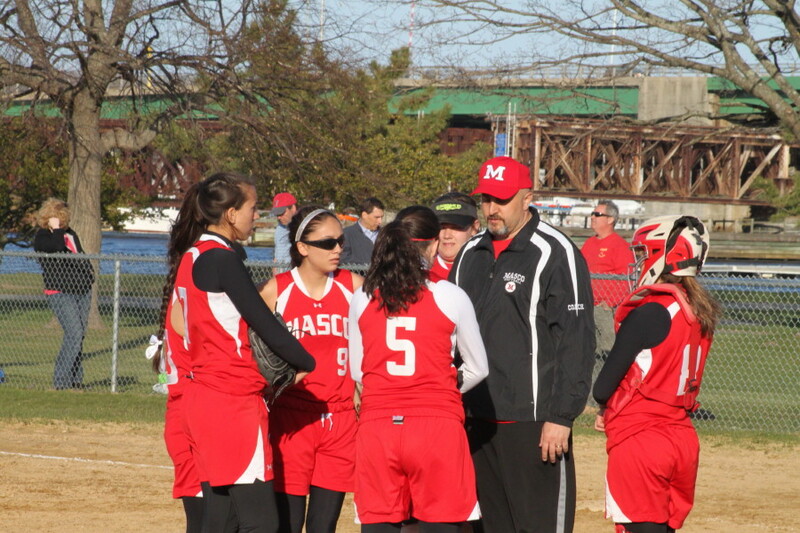 Masco went ahead once more in the fifth as Julia O’Reilly’s sacrifice fly scored Alexandra Mendelsohn. Newburyport would rally to tie the game in the 6th and have chances to end it in the 7th and 8th. Masco, however, held on and put this one away in the ninth. 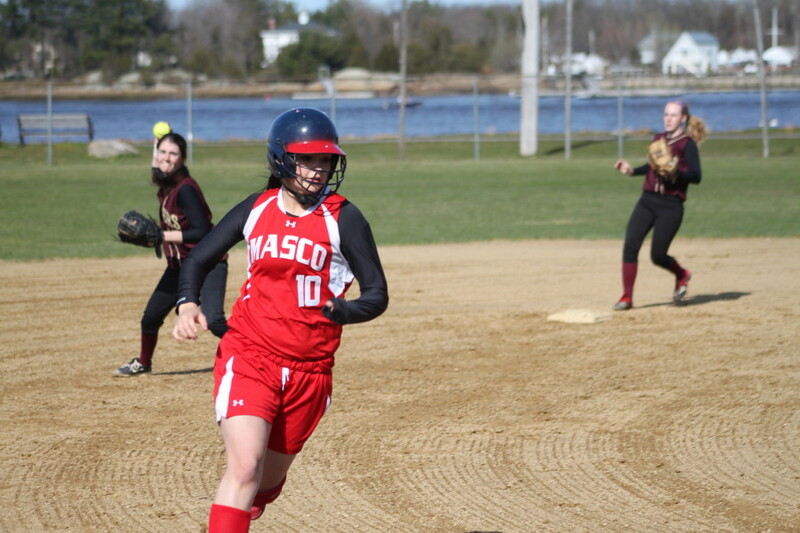 Shortstop Taylor Evans had three hits for Masco and made several strong throws in the field. 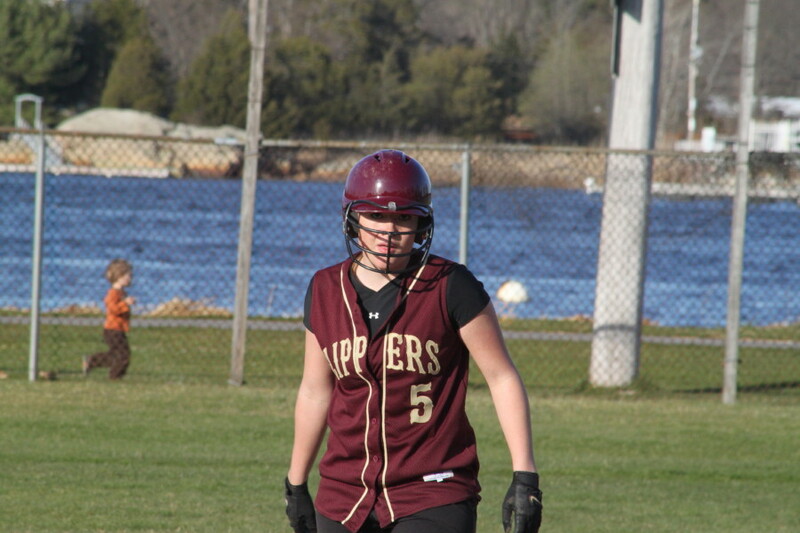 Freshman Lauren Singer and Senior Maddie Stanton each had three hits for Newburyport. Lauren took a ball on the thigh (she’s the catcher) that was painful. Beth Castantini pitched the first five for the Clippers and Molly Rowe the last four. 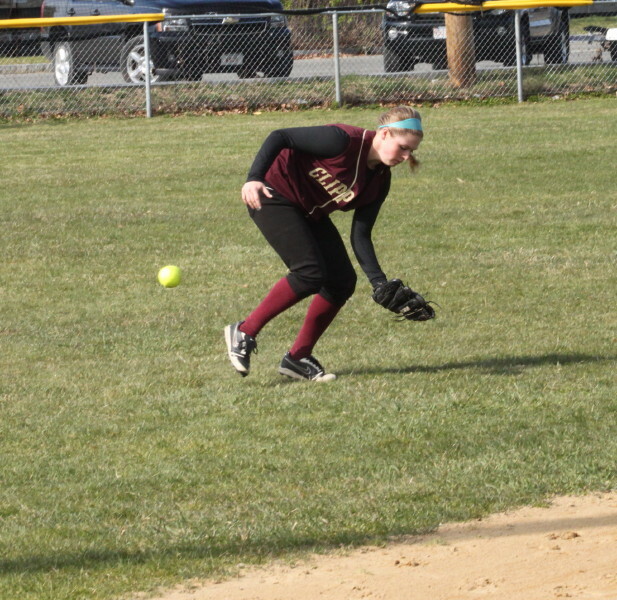 Shortstop Kendra Dow made a complete recovery in the field from the adventure she had against North Reading. 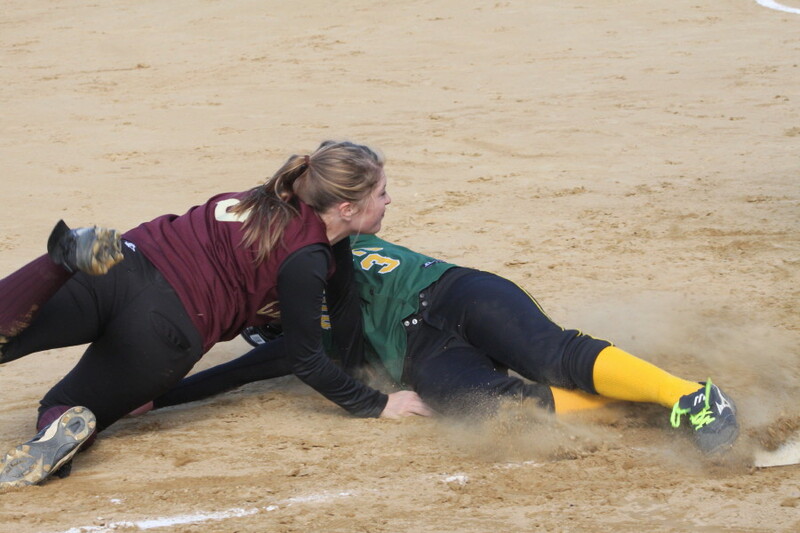 Close play at third involving Maddie Stanton and Jess Eisenhaure. (Newburyport) You know that things haven’t gone well in a softball game for one team when the topic of conversation after the game is the Mercy Rule. 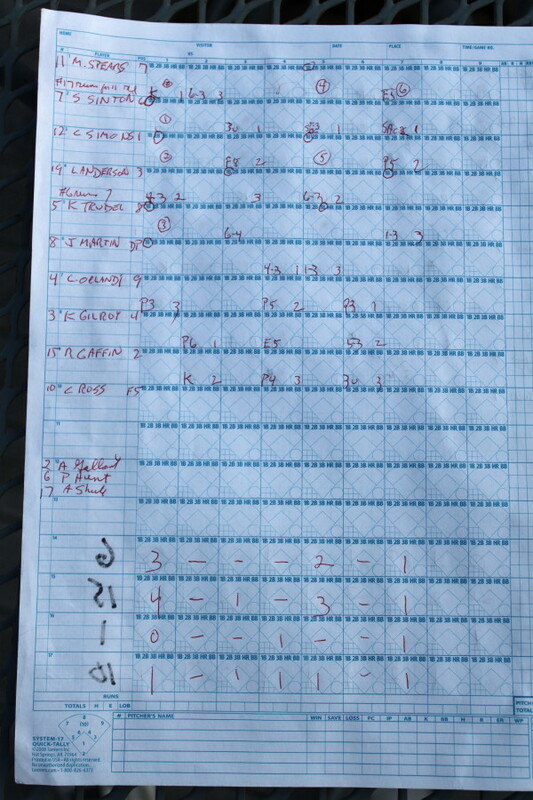 And it was Newburyport (1-1) on the wrong side of the Mercy Rule as they were wiped out, 16-4, by North Reading (3-0) in a rule-shortened, 5 ½ inning game at Cashman Park on Wednesday afternoon. As it was the game should have ended during the top of the 6th instead of after it because the Hornets had reached the 12-run margin necessary during the inning to be awarded the win. And believe me, this was a game worthy of being ended early. The Clippers are a good team but on this day……not so good. The Hornets were a very good team on this day. The only (?) positive takeaway for Newburyport from this one was their hitting in the bottom of the fifth. The Clippers needed four runs to extend the game and they got them. The key hit was a long triple by sophomore Victoria Allman that drove in two of the four runs. Victoria Allman reaches third on a two-run triple in the 5th inning. Winning pitcher Terri Ferrazzani (CAL All-Leaguer) yielded just five hits and had eight strikeouts during her five innings of work. The junior threw heat and didn’t walk anyone. And while Terri shut out the Clippers during the first four innings, the Hornets hit the servings of Molly Rowe and Victoria Allman hard. North Reading rolled up twelve runs on thirteen hits during the first four. The Clipper defense struggled with the difficult plays as well as several routine chances and gave NR way too many bonus at-bats. 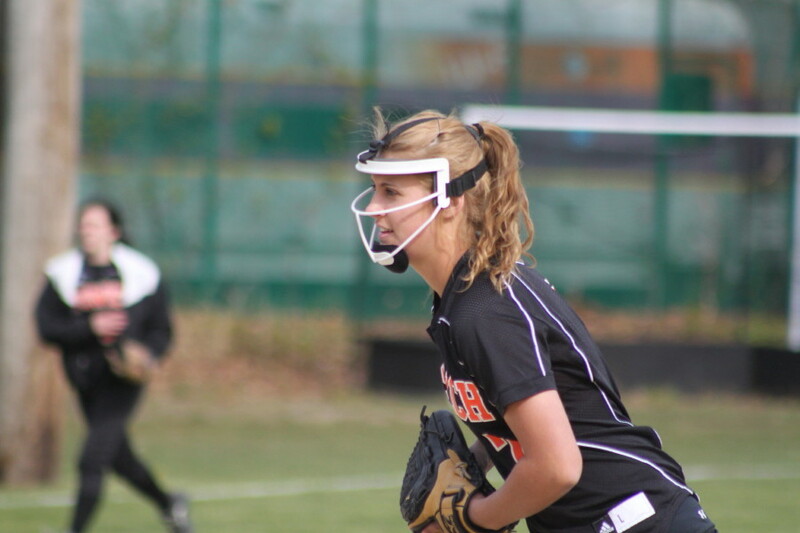 Shelby Carney – single/double/stolen base/four runs scored. 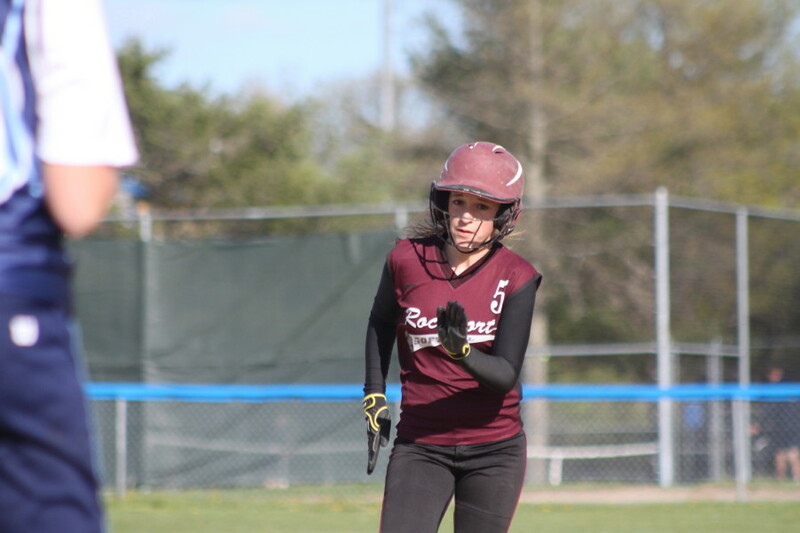 Tarah Reilly – double/stolen base/two runs scored. Merri Moise – two singles/triple/two runs scored. 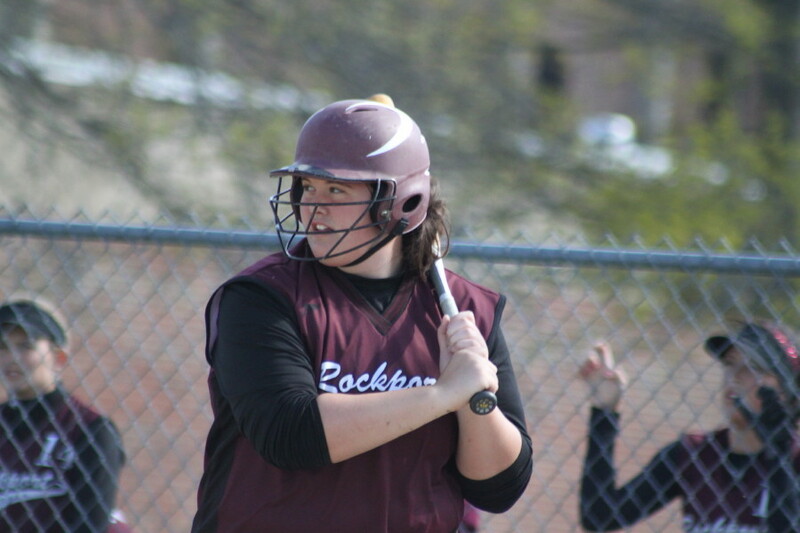 Alicia McCauley – two singles/run scored. 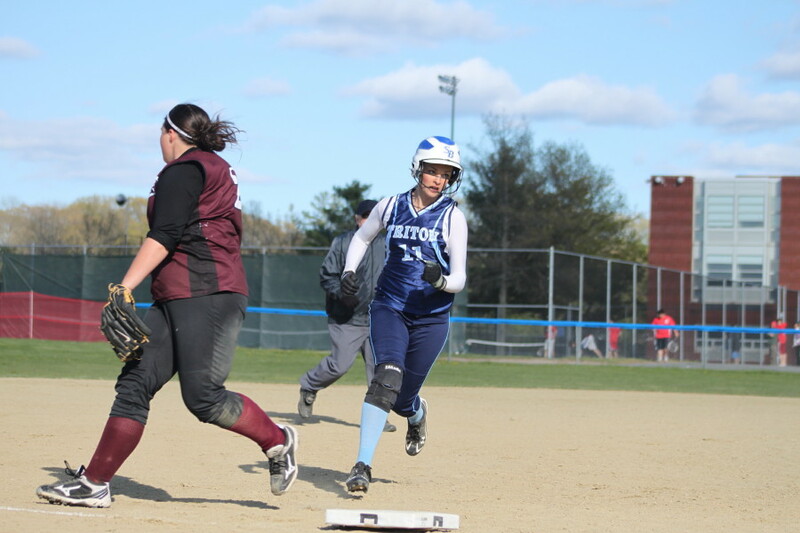 Terri Ferrazzani – four singles/stolen base/run scored. Courtney Brosnan – three singles/run scored. Lower in their order Jess Eisenhaure had a triple, double, and scored a run. 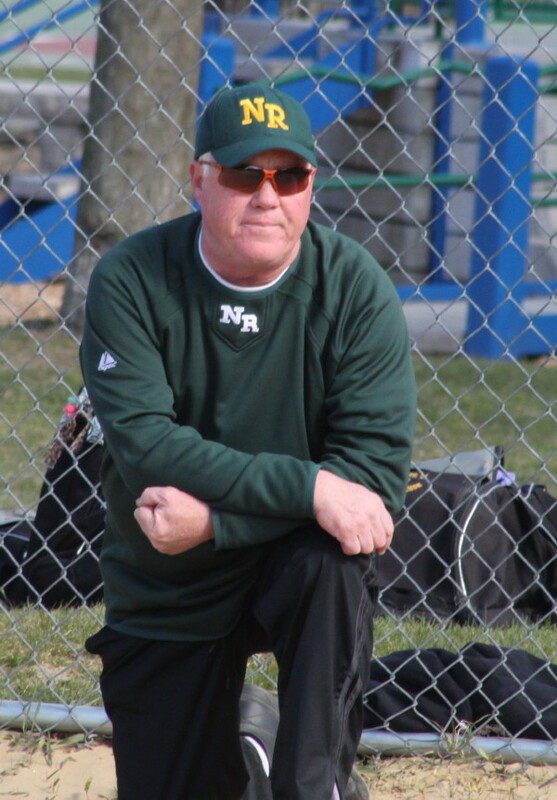 You get the point……the NR girls, on this day, hit ropes, lasers, and rockets and jammed the bases! Another day, who knows? This was a nonleague game so there will be a regular season game (April 30th at North Reading) between the two teams. 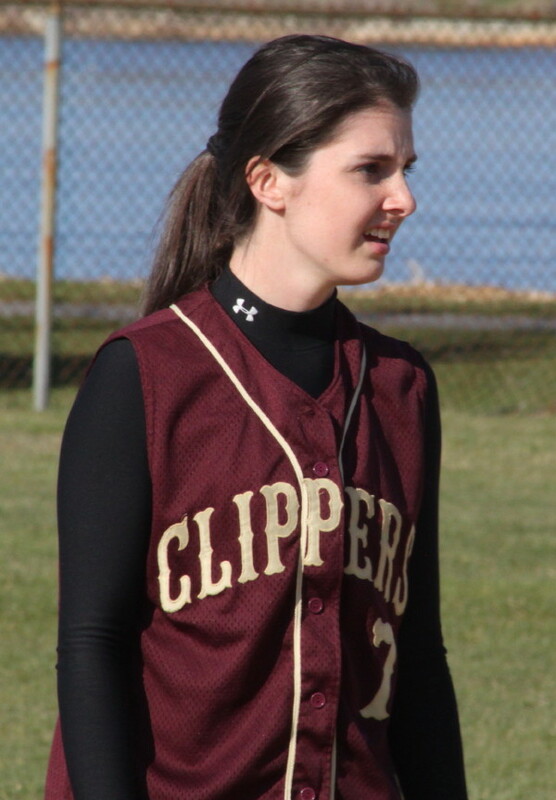 Freshman Carley Siemasko had Newburyport’s first hit with two out in the third inning. North Reading was 14-9 last year and reached the D2 North semi-finals. 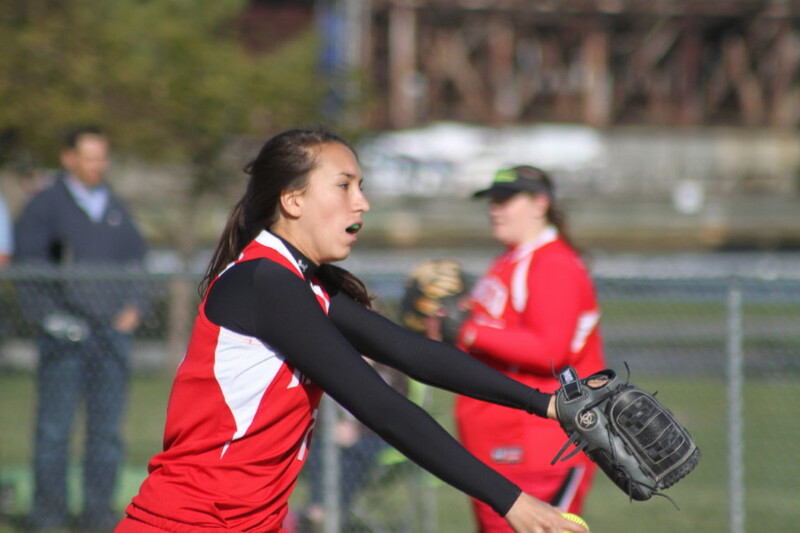 Junior Terri Ferrazzani tossed a one-hitter against Triton on Monday with 12 K’s. The Hornets play at Ipswich on Friday afternoon. 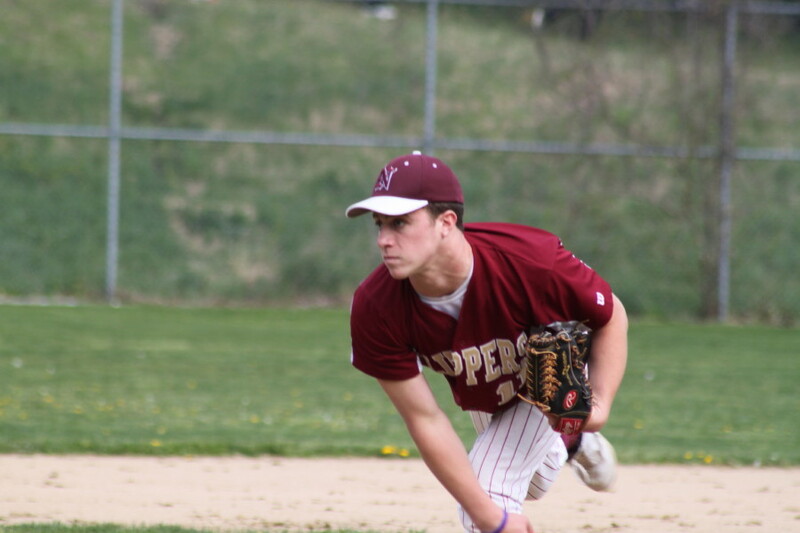 Newburyport hopes to recover against Masco at home on Friday. The wind was not a factor on this sunny afternoon with temperatures in the 50s.